The Human Rights Council at 10: too much talk, too little action? In 2016 the UN Human Rights Council will celebrate its tenth birthday. Although the anniversary—unlike the Council’s five-year mark—will not be accompanied by any formal review of its work and functioning, it represents an important opportunity to take stock of the UN body’s achievements and failures. And what is immediately clear is that although the Council is good at debating human rights, it pays very little attention to how those rights are violated in specific countries. At one level—looking solely at its popularity and the seriousness with which States engage with it—the Council has unarguably been a great success. A casual visitor to its 28th session in March would have noted record levels of enthusiasm for and engagement with the Council. After a high-level segment that saw a plethora of heads of State, prime ministers, and foreign ministers —including Sergei Lavrov and John Kerry—address Council member States, delegations buckled down to work through an increasingly packed agenda, marked by ever more resolutions, panel debates, and interactive dialogues with Special Procedures. Over the eight years and 27 regular sessions since its creation, the Council adopted a total of 762 texts, the vast majority of them resolutions (these were not distributed evenly over time: for example, in 2006 the Council adopted 43 texts, while in 2013 it adopted 112). Similar exponential growth has been witnessed in the number of panel debates (rising from 2 in 2007 to 23 in 2014), Special Procedures mandates (now over 50, with 74 mandate holders), and reports commissioned from the High Commissioner or Secretary-General (over 450 presented to the Council since 2007). Another measure of the popularity is the fact that, after the Security Council, a seat on the Human Rights Council is one of the most sought-after membership positions at the UN. A new study by the Universal Rights Group has analysed the work and output of the Council over the past nine years. The study reveals that the quantitative expansion of the Council’s work and output, especially the evolution of its resolution system, has occurred in a manner inconsistent with the tenets of the body’s core mandate. In particular, the Council has consistently prioritised discussion of general thematic issues over addressing country-specific human rights situations. Over 55% of resolutions adopted since the Council’s creation have been on general thematic issues under its agenda item three, (‘Promotion and protection of all human rights, civil, political, economic, social and cultural rights’). By contrast, country-specific resolutions under its agenda item four (‘Human rights situations that require the Council’s attention’), have comprised a mere 7% of its total output. The imbalance is also reflected in the amount of time devoted to these two items during Council sessions: between 2010-2014, a total of 646 hours (26.9 days) was devoted to discussion and activities under item three, compared to 153 hours devoted to item four. There are two main interlinked reasons for this imbalance. One is the fact that general thematic debates and resolutions are easier and less contentious—and thus more popular. Indeed many developing countries, especially those that are members of the Like Minded Group (LMG) consistently oppose resolutions focused on country-specific violations on the ground that ‘finger pointing’ or ‘naming and shaming’ are (they believe) against the spirit and objective of the Council and the wider UN system. The second (linked) reason for the imbalance is that only two actors at the Council—the EU and the US—have consistently shown the political will, and have been willing to expend the necessary political capital, to secure resolutions dealing with specific violations. Of 46 item four resolutions adopted between 2008 and 2014, 56% were pushed by the EU or a leading EU member State and 20% by the US. One important consequence of the Council’s reliance on Western Europe and the US to drive country specific resolutions (albeit sometimes in concert with the African Group)—along with its unprecedented decision in 2006 to dedicate an entire agenda item to just one human rights situation (the Occupied Palestinian Territories)—is that the body has been highly selective in terms of which human rights crises to address. Since 2007, only 14 situations of country-specific violations have been deemed to ‘require the Council’s attention’. When one considers the scale and breadth of the human rights violations that have taken place since 2007, it is clear that by addressing only 14 situations, the Council is guilty of a serious dereliction of its responsibilities. For example, an objective observer might find it questionable that of the ten lowest ranked countries in the Economist Intelligence Unit’s 2013 Democracy Index (i.e., the ten most authoritarian regimes), eight have never once featured on the Council’s item four agenda. Such trends are clearly contrary to the Council’s principal mandate of ‘address[ing] situations of violations of human rights,’ as originally envisioned. We’d all like to believe that governments did not create the Council just to generate more talk and paper, with little real action to protect human rights in concrete situations. As the international community looks towards the body’s tenth anniversary, it must address such institutional imbalances in order to translate its contemporary popularity among States into real world relevance and impact. This article was originally published on opendemocracy.net. 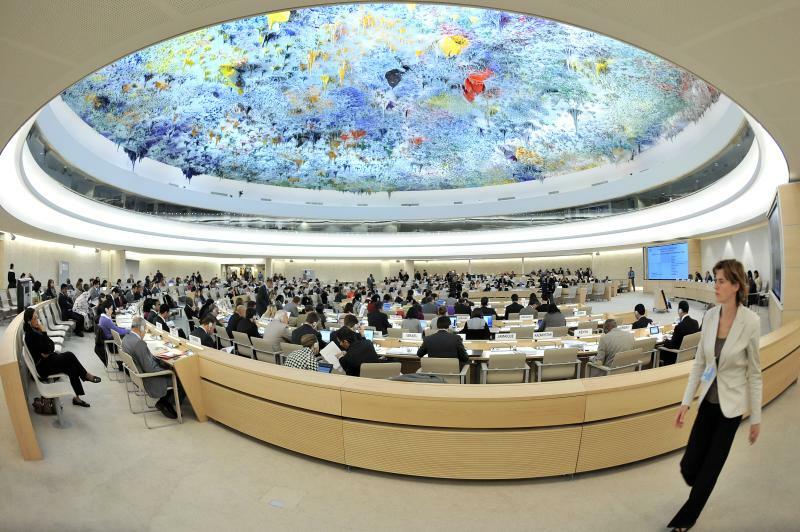 Feature photo: Human Rights Council by UN Geneva, licensed under CC BY-NC-ND 2.0.